Planning Dispatch by Garry Miley - Irish Planning Analysed, Planning Ireland - Are you an Urban Creep? Are you an Urban Creep? … written by someone who’s never had to deal with the planning system in their life. For example, can you imagine how many Requests for Information will accrue from the undefined term ‘significant hard surfacing’? (Significant in global terms? Or a significant part of what is in reality a tiny little garden?) 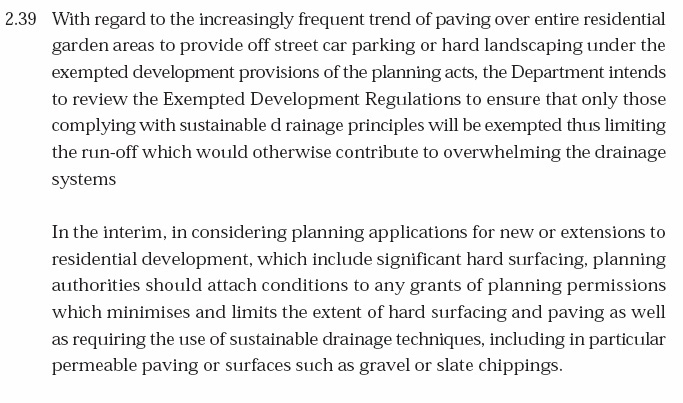 Or the suggestion that conditions be added to approvals which ‘… minimise and limit the extent of hard surfacing…’? On this last one, I can guarantee you that every time an application is lodged which includes any amount of paving – any amount at all – a request will go out telling the applicant to reduce it. This will be a standard FI this time next year. Wouldn’t it be so much easier to say: anyone in a two up two down in the suburbs thinking of putting in paving around their house, use one of these three pre-approved details and you’ll be fine. Write a note to us and confirm that you're complying with the rules. If we catch you out, you're in trouble. … should be tossed (as should the definition of 'Urban Creep' which suggests ‘the spread of surface paving into the countryside’ and not what you and I think it should mean).